I am sitting at the studio looking at this gorgeous memory of a meal from last week, pretending like I have myself put together and that I’m going to write a nice, thoughtful post about how much I love these kale and chicken quinoa bowls with marinated kale WHICH I DO LOVE SO VERY MUCH. … I think I might be better of just coming clean with you and just admitting that today is all about playing email catch up, sipping on an extra coffee, getting my lion’s mane of hair officially untangled, and finding my way back into easy + delicious + clean post-weekend-trip food. I mean, if I could just eat A SINGLE VEGETABLE today and maybe wear something semi-clean, I’d be winning. You’re feeling Monday too? In the not-best-possible way? Come with me, friends. I want you alllll aboard this yummy train. This bowl is everything clean eating should be: nutritious, full of flavor, multi-textured, satisfying, colorful, and all-around happy. That’s because it’s loaded with seasoned quinoa, lemony chicken, and the magical thing known as marinated kale which is actually, um, just like it sounds. Marinated Kale. Mind blown, right? Also – you know there’s gotta be an avocado half on that bowl because VEGETABLES, and don’t think for a second that we are going sauceless. Load it up with that sun dried tomato sauce, guys. Just load it up. It comes together quickly, it’s really pretty to look at, and it’s flexible to whatever ingredients you have on hand –> I just got a flash vision of grilled asparagus on top of this which is not at all seasonal in this hungry minute, but maybe someone will happen to find this in the summer someday and be able to use that glimmer of a good idea – it’s like a recipe message in a bottle for someone in a happier summertime place. Dinner tonight! I’m thinking this rainbow bowl + you, me, Ben, and all the right reasons. I didn’t just say that tho. 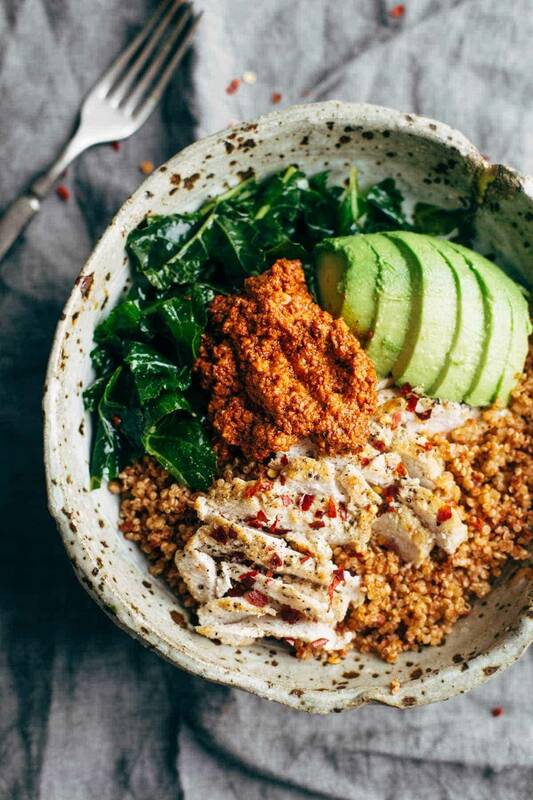 Marinated Kale and Chicken Quinoa Bowl with Sun Dried Tomato Sauce! 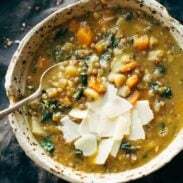 This recipe is clean, simple, and nutritious! QUINOA: Cook the quinoa according to package directions. When the quinoa is done, stir 1/2 cup of the sauce throughout to distribute. In the pictures I’m using baby kale but I really prefer this with regular kale – baby kale starts to go soggy pretty fast with the marinade. Nutrition label does not include sauce, as amount will vary based on how your build your bowl. I really love all of your recipes, healthy, wonderful ingredients! I don’t have a food processor, but I do have a blender, will this work? 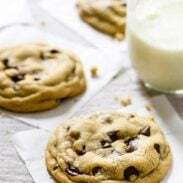 This is my first time to your site and I promise it won’t be the last— this recipe is awesome! I made this for my lunches this week and actually said “yum” out loud multiple times while eating this! Would this recipe work with cauliflower rice instead. I’m going to try. I assume you mean cauliflower rice instead of quinoa? I think that would be fine! where are her speckled taupe bowls from? Made this last night and it was quick and delicious! The sun dried tomato sauce is so flavorful and went perfectly with all the other components. Will definitely make again! Do I split the marinade between chicken and kale or make a marinade for each? Great question! You split the marinade between the chicken and kale. This recipe sounds amazing, and I plan on making it in the coming weeks! Only thing is- there is a nut allergy in the household. Can I just omit, or would you suggest adding something else in? I’m not too sure what the almond component adds to the sauce! This recipe sounds amazing, and I plan on making it in the coming weeks! Only thing- there is a nut allergy in the household. Can I just omit the almonds, or would you suggest subbing something in? I’m not too sure what the almond component adds to the sauce! Really, I was already your fan. But seriously, with this you outdid your darn self. I just made it for the first time and could not stop eating it. What an orchestration of taste with a fabulous balance of awesome nutrition. I can’t wait to try more of your recipes. This was sooooo delicious! Normally I don’t repeat recipes, but this one is definitely going into the Keepers file. I’ll admit we forgot to marinate it, which is kind of the whole point, but we just squeezed lemon on the chicken and the kale, and massaged the kale like one of those salads to soften it up before throwing it all together in bowls. The sun dried tomato sauce is AMAZING and I want to eat it on everything. SO delicious! I’m happy to say I’m no longer afraid of quinoa or kale after enjoying this. Oh my. This dish is soon good. The sauce is great. Love it. Glad you enjoyed it, Greg! A friend broght this to us after our baby was born 8 weeks ago, and we love it! Making it now and wondering how much kale, and how fine to chop it. It says 1 bunch of kale but sometimes that’s relative…I currently have a freezer bag full but when I cut the marinade in half it didn’t feel like a thick enough coating to permeate the kale, so I added about the same amount more…fingers crossed it isn’t too strong or too weak of a marinade. For future reference how much kale (gallon bag full?) and I guess that will let me know that the kale/marinade ratio is correct! Loved this recipe! As did my whole family! I actually added some almond milk to the sauce and it tasted great. Almonds you used or flaked? I’m thinking whole? Thanks! Ooh. That Sundried Tomato sauce sounds glorious!!!! I see it smeared on a grilled cheese or dolloped on a soup. Just so you know, your idea for asparagus in addition to the rest of the recipe has been noted by someone in the summertime. I can’t wait to try it. Loved this! I miss read and got roasted red peppers. It was delicious! We also used collard greens instead of kale because that is what we had on hand. Will be making again! Wow, this looks yummy. I LOVE sun dried tomatoes. Maybe this recipe will help me to enjoy kale. Hope you enjoy it, Melinda! wow what an awesome recipe. Just love it. Ooo this sounds like a great dinner! thank you I am excited to try! we all know that feeling after a fun vacation where you just need to eat some veggies!